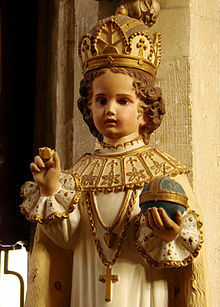 The “Infant of Prague”…hiding out in my closet? There are amazing the things you’ll find hiding out, packed away in your closet. Recently we had a water heater that lived in a closet in our bedroom (one of two, we live in a double) start leaking and our Landlord, Curt ( a kind and generous local Scoutmaster an all around good guy) came in and pulled 1 of the 2 water heaters out ( the leaking one) and replaced it with a new one for the upstairs apartment. My David helped where he could and later mentioned that in the course of changing out that water heater he and Curt had found 2 Marine propellers and 2 wastebasket and a huge box of fluorescent light bulbs. This all occurred about a month ago. I just opened the closet again to check on it and noticed the floor was damp again. So Dave found another slow leak and he’ll let Curt know one of the pipes has a little constant drip action going. But to my surprise when I went to go close the closet door after really looking at each and every little nook and cranny I noticed as I closed the door a little knob of a thingy wedged between the old good water heater and the wall. It was kind of gold knob thingy. So I got the flashlight back out and lo and behold it’s the tippy top of a statue of the Infant of Prague. So I reached in and pushed it up to where it could be reached from the top of the water heater and was truly amazed thinking about how long this soft plastic yellowed infant has been holding his orb up in the darkness of that closet all these years. O.K. my Infant doesn’t look quite so spiffy, he’s more than a little yellowed ( he’s plastic) he was made in Rockland, Massachusetts with a stamp on the bottom of his plastic pedestal that reads “Nan-San” Rockland, Mass. And the orb is blue and his eyes are blue and his crown is gold. So all the while he’s in the closet holding up this orb (representing the Earth) through some very tough things that happened to the people living in this house. The furthest back I can go is about 40 years ago. At that point there was a family in here where the Dad had breathing problems and had to stay on the first floor because he couldn’t do the steps and eventually became wheelchair bound and then passed away here from a heart attack. I presume in the bathroom, because when his daughters came by years later all grown up and asked to see the inside of the place the youngest daughter (now in her thirties) went into the bathroom and came out sobbing. Her older sister held her and then they explained to me that their Dad had passed away here in this house and shortly thereafter their Mom also passed away here too. They had been split up between relatives and very tough time in their collective lives began with those losses here in this house. But what a pair of sweet young women they grew up to be, and I know their parents would be so proud of them. Both now Mothers and raising their own children. And working through the troubles of the past by stopping here with their own children answering their questions and starting to heal the hard times so they can move on and build the good times with their own children. It was a very brave thing for those two young women to do. Then there was the murder-suicide, years later in this same house . Goodness. I found this out about 5 months after we had signed a year lease on the place. It turns out that in the upstairs apartment there had been a Dad a Mom and two boys and one day the Dad lost it and and threatened the Mom with a gun and the Mom yelled to her boys to get out of the house and the Dad shot and killed the Mom but not before she witnessed her boys get safely away. Then he killed himself. To this day I think that this house is clear of bad feelings, it’s O.K., because the Mom KNEW when she died that her babies had gotten away safely. I believe how you go makes a difference and knowing your kids are O.K. can make just about anything bearable. And all this time that little plastic statue of the Infant of Prague was here, stuffed down in the closet between that water heater and the wall , doing its best to secure the best outcome to some of the worst possible events. Because sometimes that the best life can offer. Terrible and horrible things will just happen in this life, guaranteed. It’s the learning to keep on . Learning how to just keep going. How to put one foot in front of the other even through the worst or best because like the bible says, “this too shall pass”. Good or bad. Maybe that’s the promise of the infant holding up the world in the darkness of the closet all these years. It really is going to be O.K. just persevere, keep the faith and it will be ok, if not ok then at least bearable until we meet again. And that’s what this life really is. Your finally learning this is a limited time offer to just realize it really is going to be alright. No matter what. This too shall pass. So if it be good, your babies are laughing or cooing and you’re in love with your life be happy now in this moment, enjoy it NOW. And if this is the most desperate time of loss and loneliness, have faith and this too will pass. For it all will that’s a fact. We’re born we die but we all travel the same circles and cycles, together, sometimes you just can’t make out the other person because their at a diffent point in the path. But make no mistake. None of us is ever lost. World without end Amen. Super writing, Ma. I love the thought that that little bit of hope was hiding there all that time through each of those people’s dark moments. What a beautiful post! Thank you for sharing it.